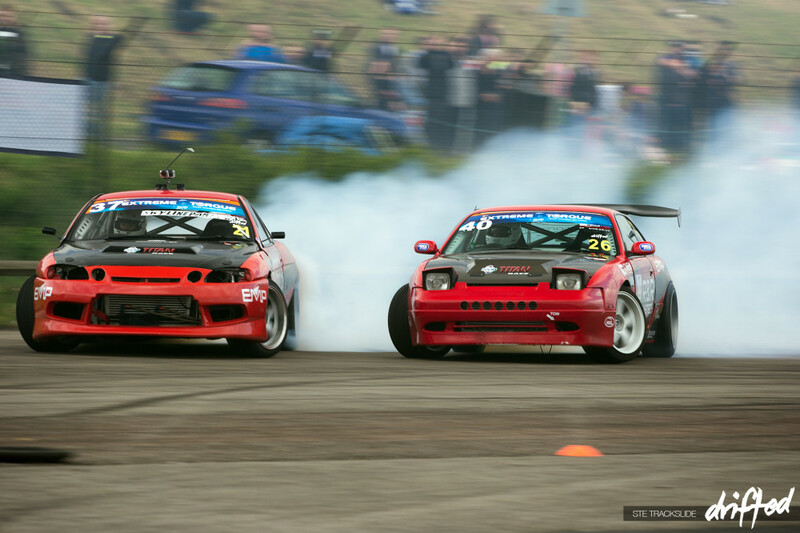 I really enjoy events like these, where some of the finest drift cars and drivers in Europe come together for what is best described as ‘just a fun day skidding’. Unlike the major championships most of these drivers enter, the Extreme Torque Show is a no pressure free for all where novice drivers can go up against some of the best drivers and cars in the country. 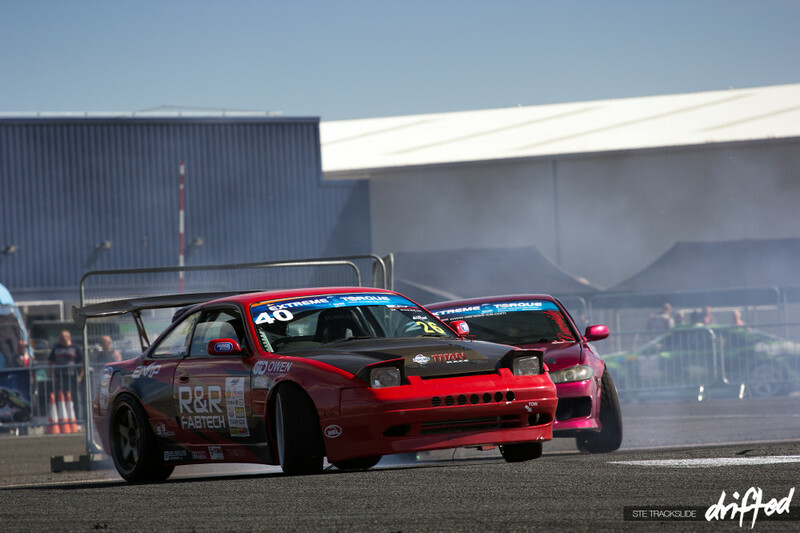 Obviously there is still an element of competitiveness between them, which is a good thing as that keeps the level of driving at a high standard, but there is a generally more relaxed atmosphere than some of the other high profile events you can attend. 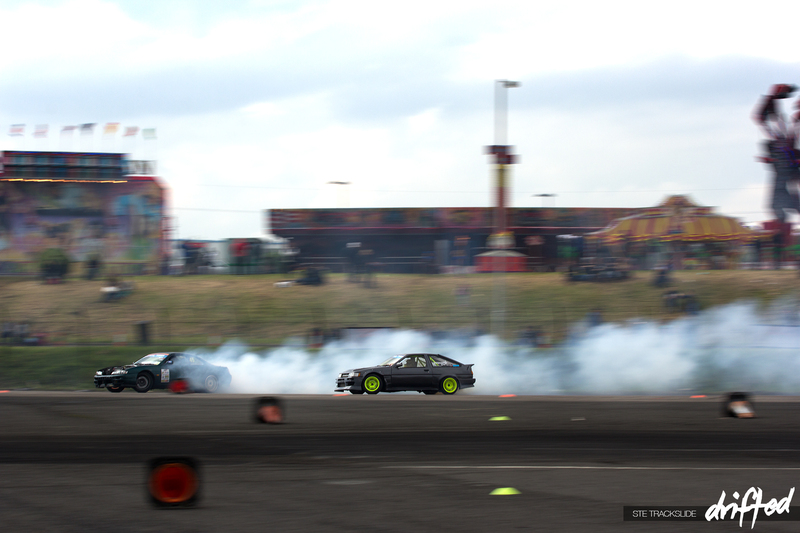 After a wander around the pits I knew we were in for a good weekend. 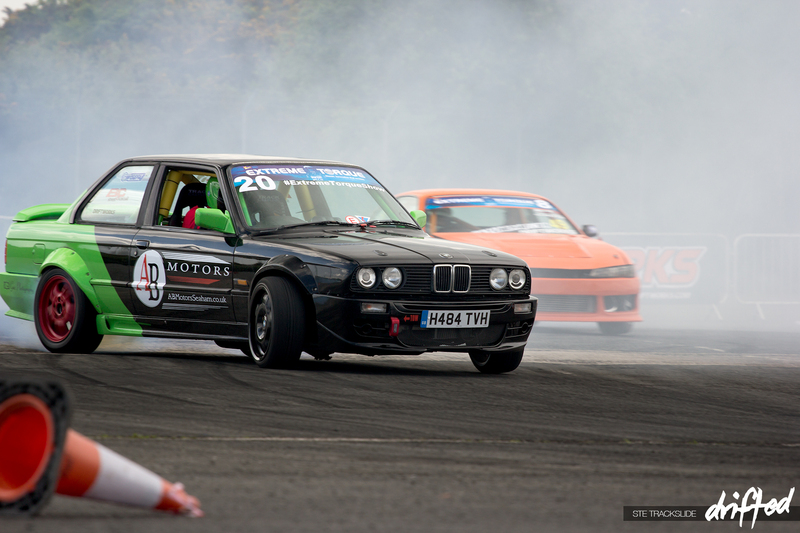 BDC driver Tony Walker was in attendance with his pink BMW V8 Supercharged PS13, sporting a rather large rear diffuser. 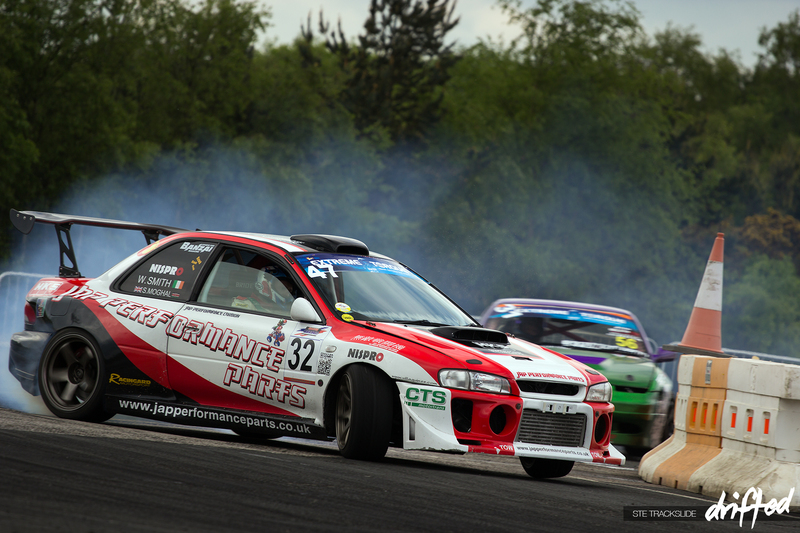 I’m not sure about downforce but it seemed to divide opinions for most of the weekend fairly well. 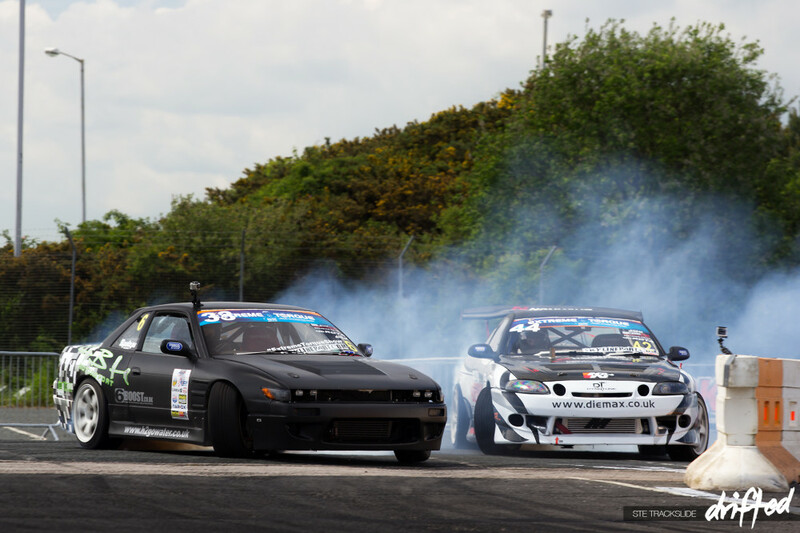 I love big body drifters so naturally I was quite excited to see these beauties here. 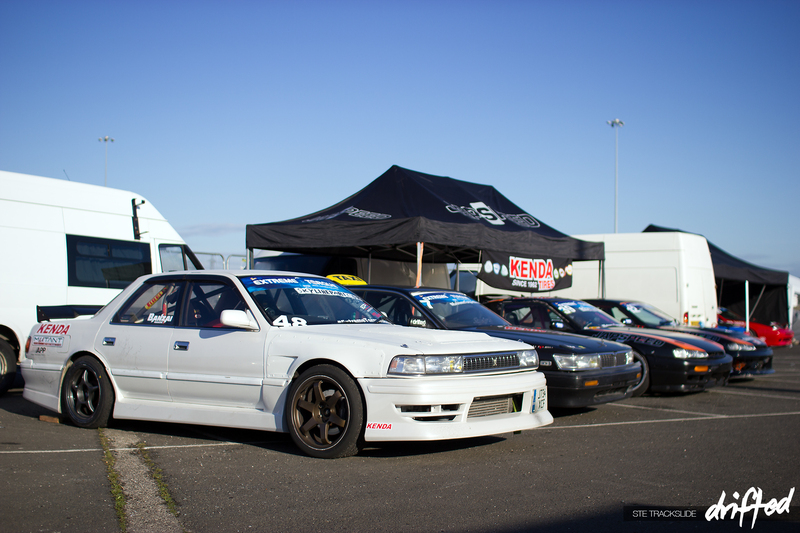 There is just something about JZX chassis and Laurels that give me a warm fuzzy feeling. 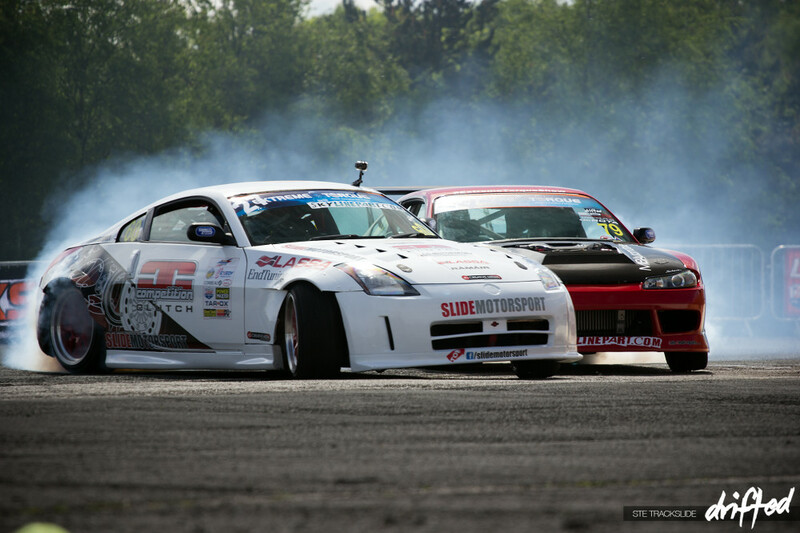 These are deceptively slow looking cars but never judge a book by it’s cover; “It’s a trap”. 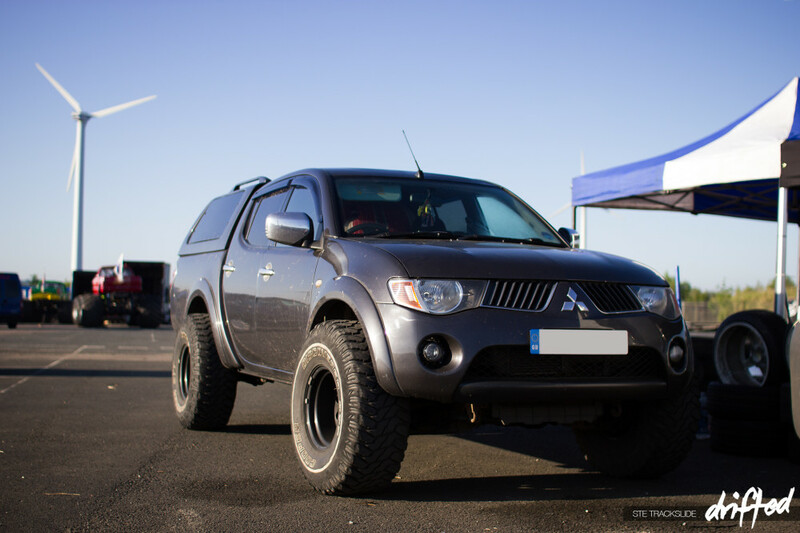 I couldn’t help but notice Ryan Toporowskis tow vehicle; most drivers opt for some sort of economic van, or similar to tow their cars around due to how expensive this game is… Ryans L200 gets 4MPG. Fair play. 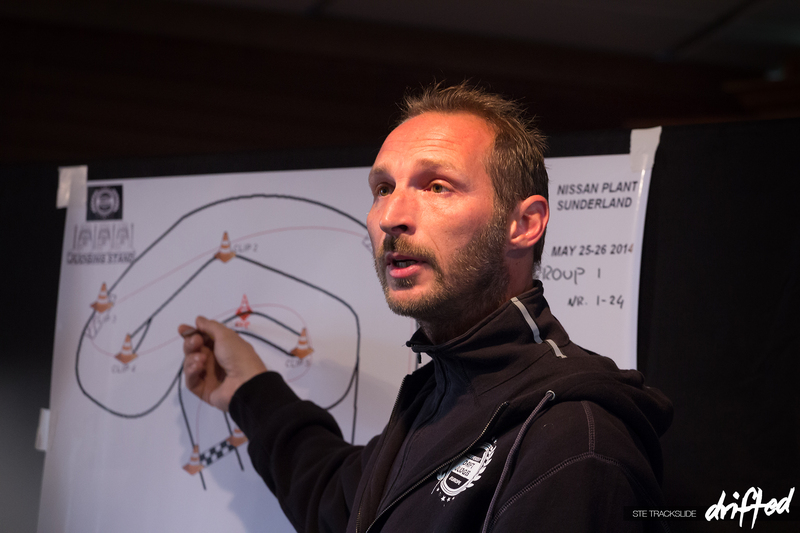 The drivers briefing was interesting; with a very complex 1, 2, 3 cone/2 box system it was certainly one of the most complicated briefings I’ve attended here in the UK. After leaving the startline the drivers hit the the first set of single cones, between them and the next double cones marker is the ‘full throttle’ box where both drivers are required to floor it. Once the drivers pass the double cone marker they are in the ‘proximity box’ between the double and triple cone markers. Here they are required to be as close as possible. If the judges feel they were too far apart, the run is scrapped and they go again. Simple but effective… kind of. During the practice session the drivers were finding their feet; there were no track markings during the first day due to the weather, just a cone layout. 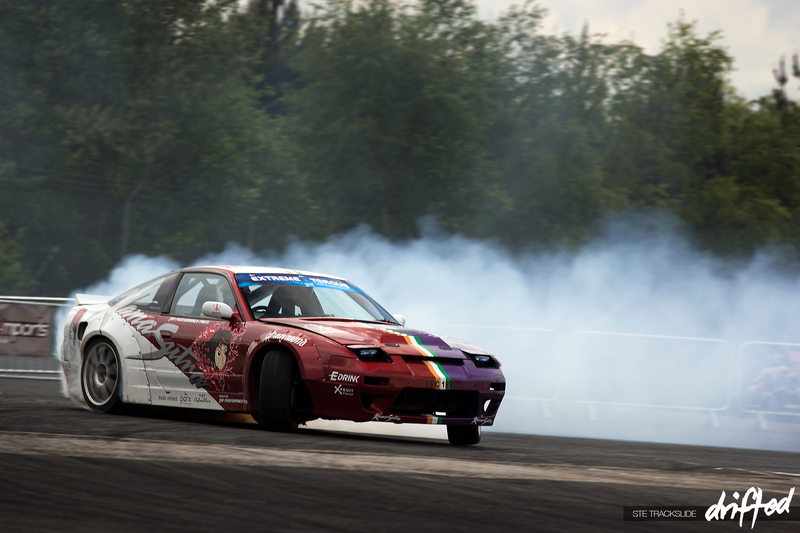 The GDA cars look great anywhere, and are quite possibly the loudest drift cars I’ve heard. As practice continued the weather improved, as did the driving. 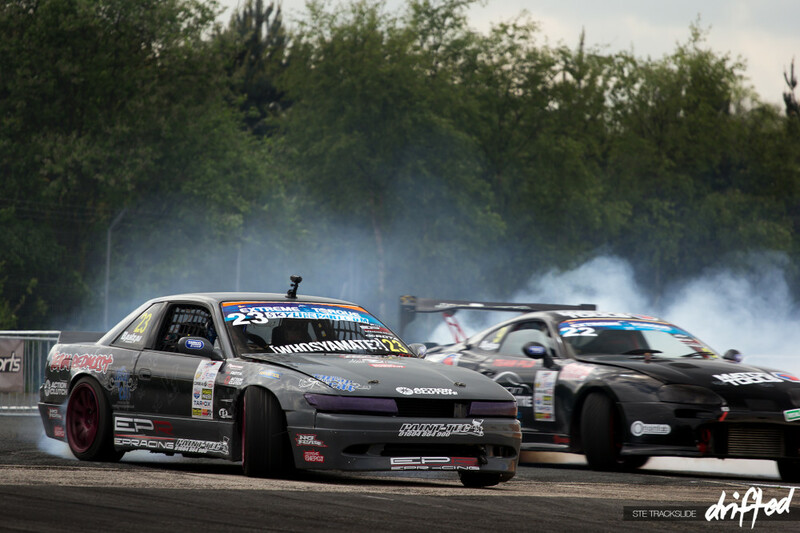 Ricky Emery only just made it to this event in his Toyota Soarer after a minor altercation with a wall at Drift Allstars London a couple of weeks ago. After a few long nights he managed to get it sorted just in time. 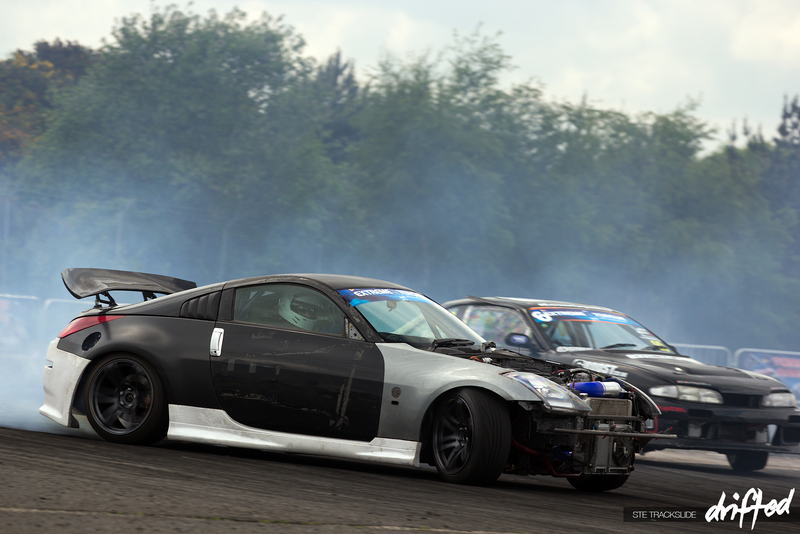 Pretty much every driver was approaching the first corner with caution, and for good reason; the ditch. 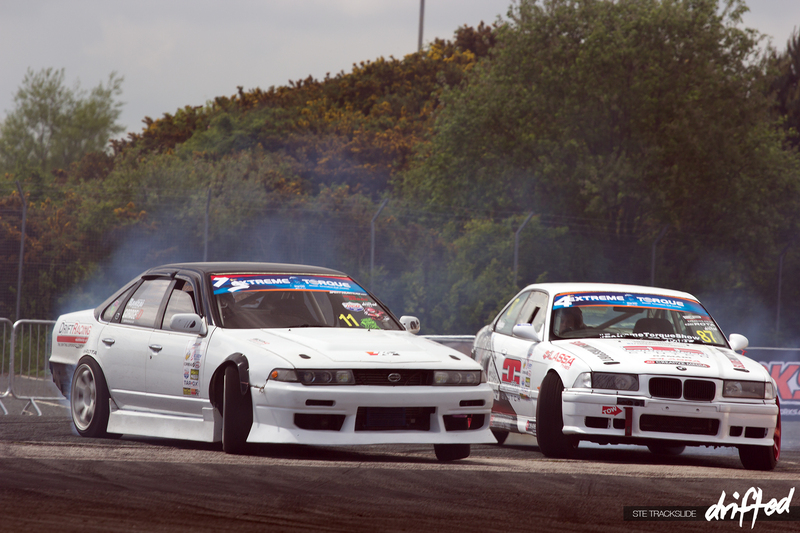 Running the full outside length of the first long sweeping bend is quite a significant ditch that has claimed cars at previous events. With nothing more than a flimsy wooden fence separating the track from a 5ft drop, it was fairly obvious that someone would be in there before the event was over. Mark ‘Cookie Monster’ Annette of Team Redmist has been great to watch over his past couple of events, with every session this year I’ve seen his confidence grow more and more. 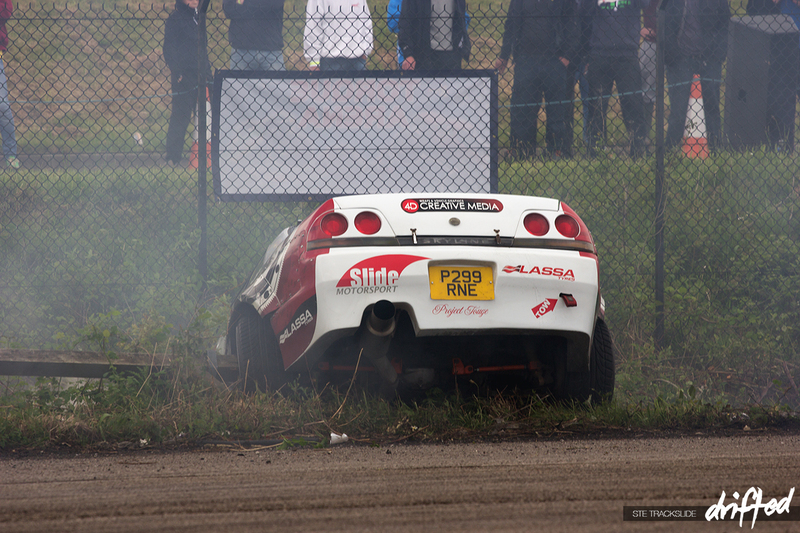 The first victim claimed by the ditch was Adam Simmons’ Rocket Bunny’d R33 V8; it was a damned shame. 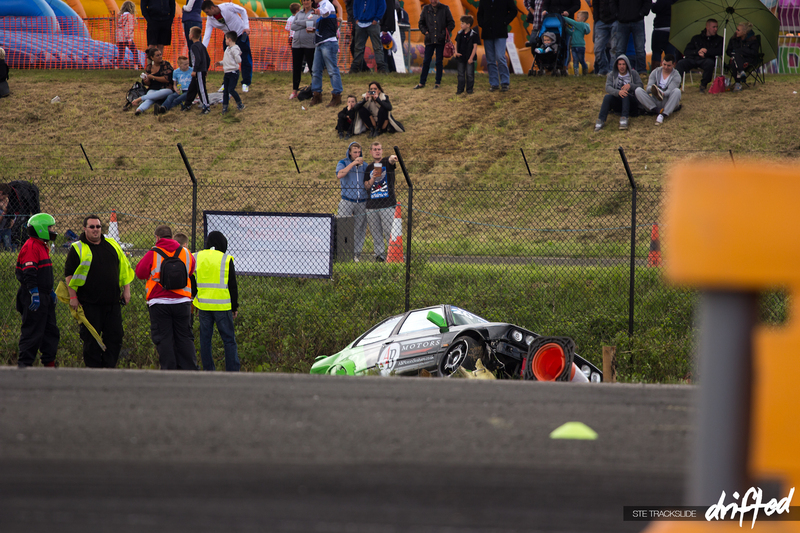 With catastrophic damage to the engine and chassis Adam was out for the rest of the event. 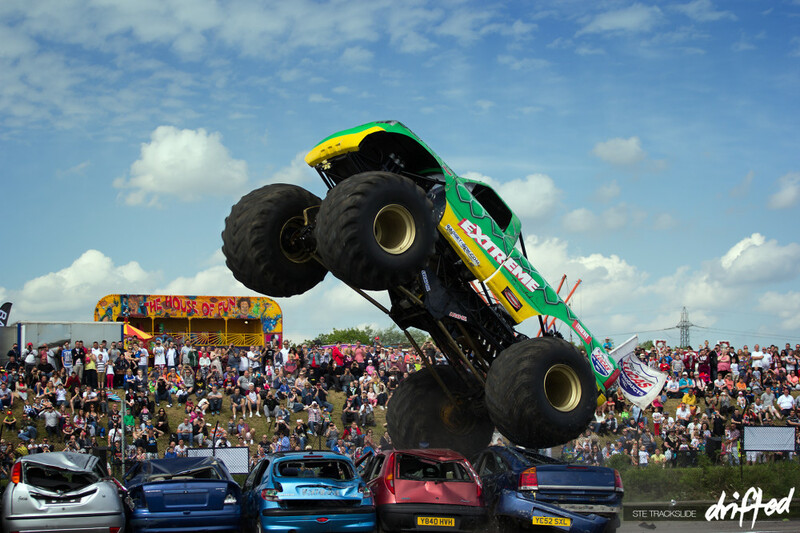 Cue the Monster Trucks! Personally, I’ve been a huge fan of these things since I was a small boy; I mean, what’s not to like? There were 2 trucks, both broke at some point, but look at them and what they do; they’re going to break! A good show from my view. 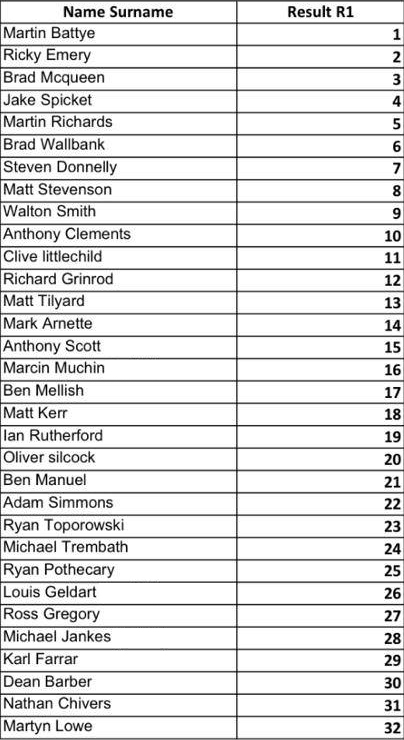 At the end of day 1, qualifying had been finished; some good action and lots of twinning had given a taste of what was to come the next day. 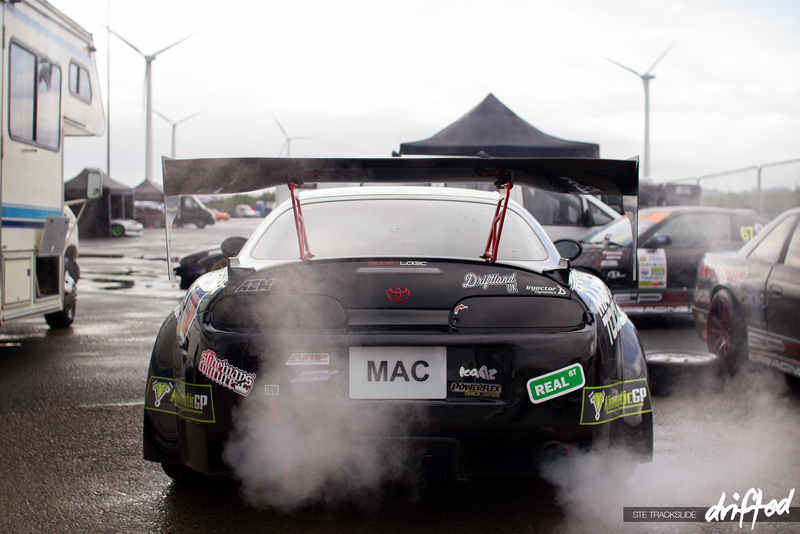 Marcin Muchas’ Supra is a pure smoke machine and he was putting in some very impressive runs until something seemed to break, affecting the cars handling as he kept spinning run after run. A rare sight from this usually very consistent driver. 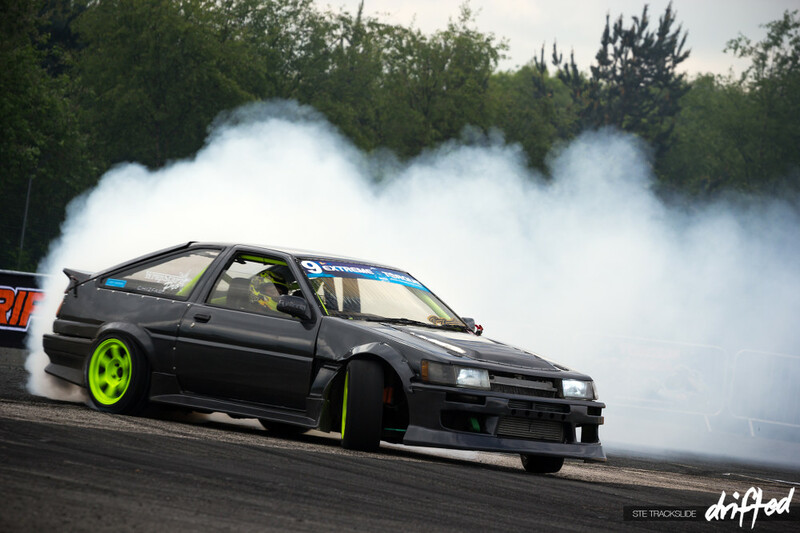 Clive Littlechilds AE86 Levin is a great looking car. 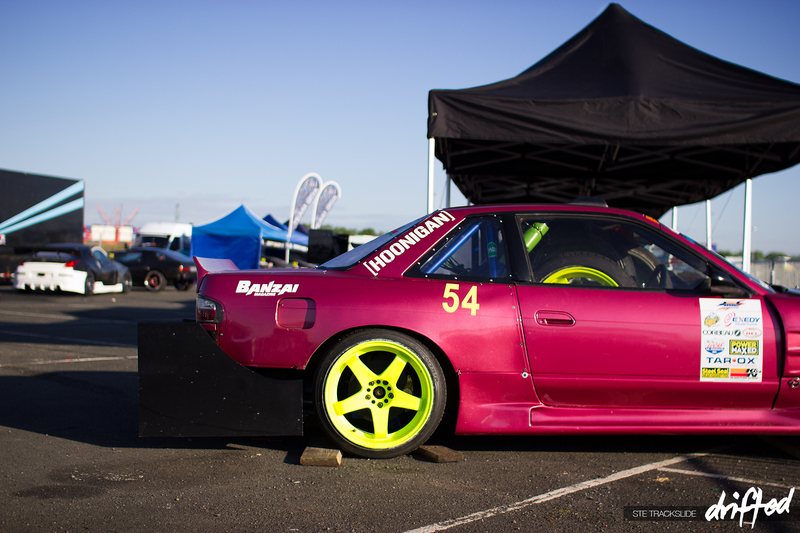 It’s hard not to love a Levin and it’s awesome to see people still drifting these iconic cars. 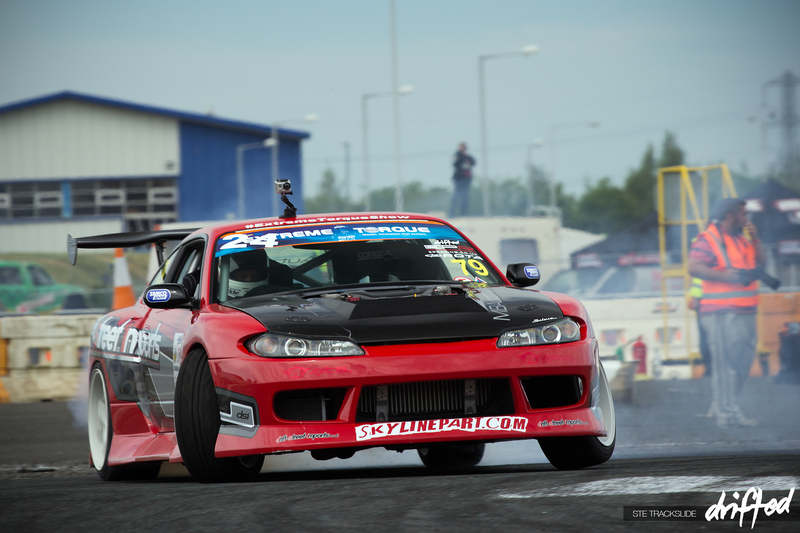 Martin Battye’s VR38DETT (Nissan GTR V6 Twin Turbo) powered S15 is an epic car. Martin was putting in some of the best and quickest runs of the event. Very consistent and definitely a man to watch this year. 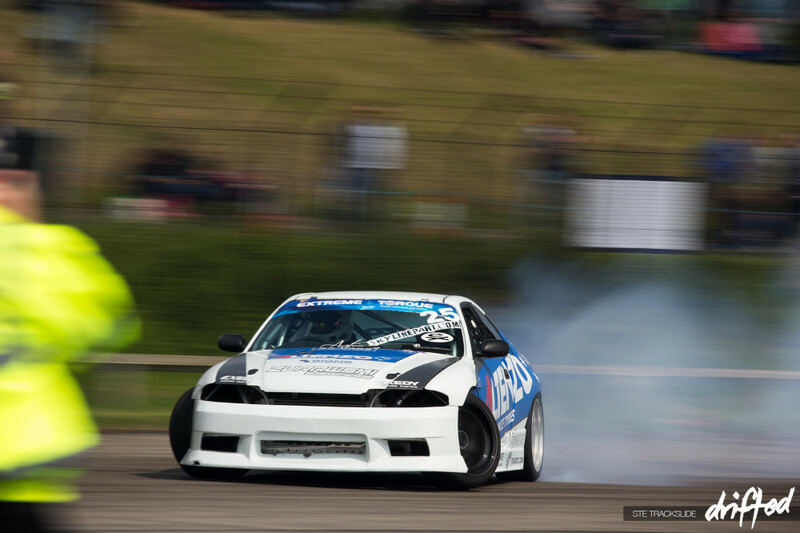 Steven Donnelly also drove well all weekend in his Diemax Soarer. 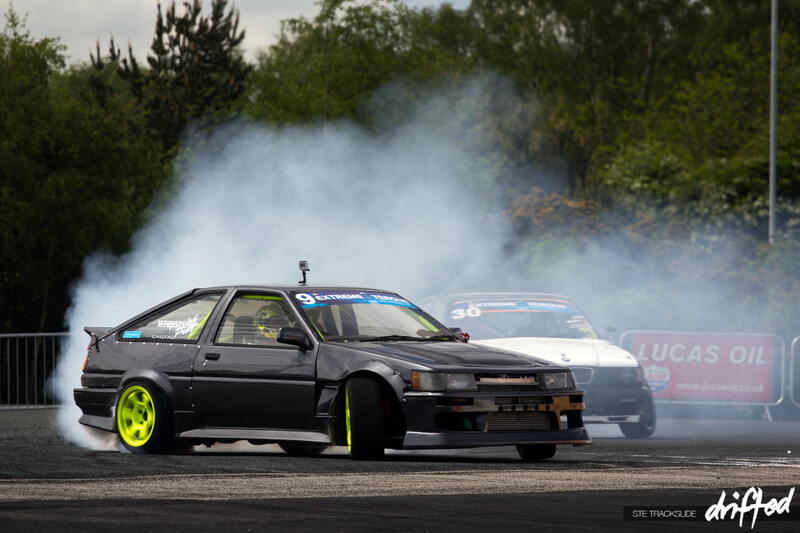 This car sounds better and better every time I hear it with that awesome 1JZ straight 6 turbo with 600bhp screaming away under the bonnet. Another victim claimed by the ‘ditch of death’ was John ‘GB’ King in his Wisefab’d e30 V8 BMW, knocking him out of the event. John has been busy though and has nearly fixed what was initially thought to be a write off. More monster truck action left one of them in pieces; after a hard landing one of the front wheels decided to make a break for it, but luckily it didn’t go too far. A rouge wheel and tyre weighs around 385kgs and could do some serious damage to whatever it hits. The driver/pilot seemed quite happy with his accomplishment. Ian ‘Bizz’ Phillips was out testing his brand new 350z build which was quite literally finished the night before day one. 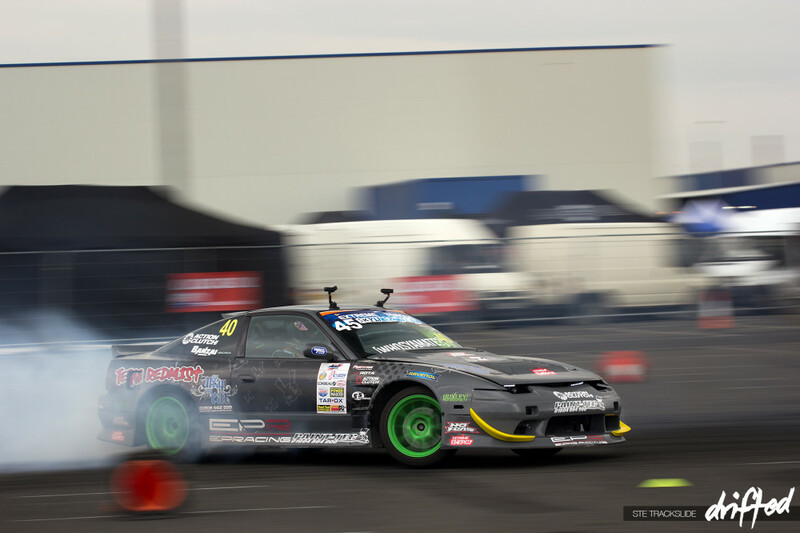 He was running the same Chevrolet LS3 V8 motor that he used in his old R33 Skyline. 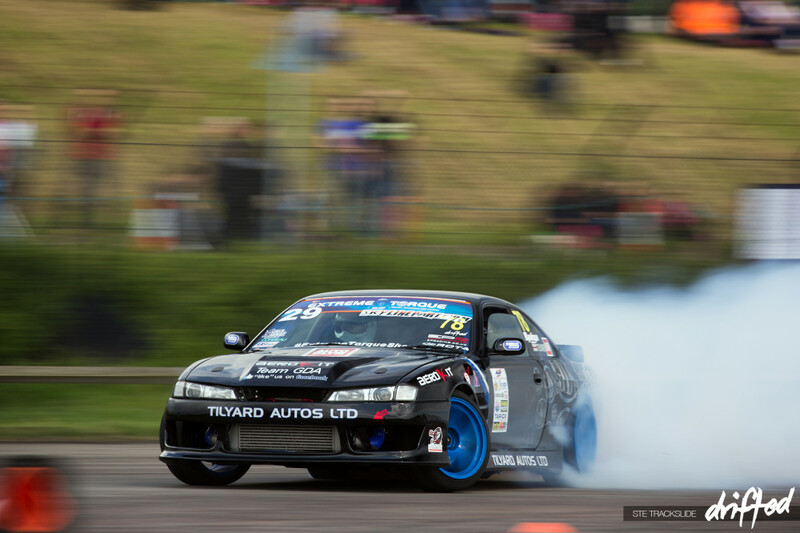 After a couple of runs and a few teething issues aside he seemed to be getting used to the new car very quickly. We look forward to seeing Bizz competing in the UK soon. 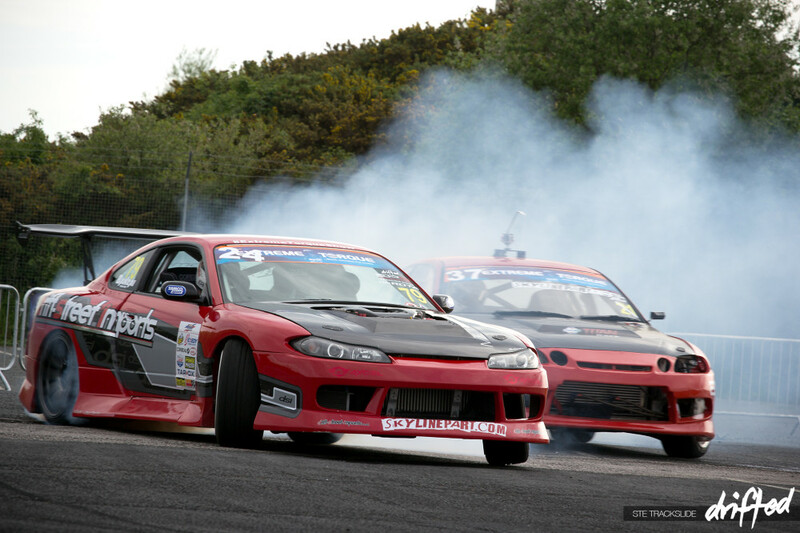 Martin ‘MbAutomotive’ Battye took the win in that awesome S15, summing up a very good 2 day event. 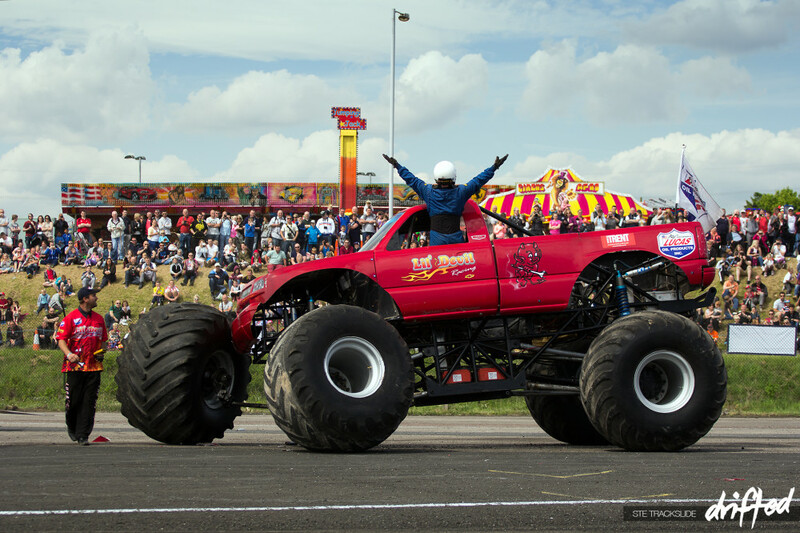 The Extreme Torque Show is definitely one of the more ‘laid back’ UK events and I can only see it getting bigger.